^Yes, two miniature bottles of Coconut Ciroc. Wow! As you can probably guess from a lot of my posts, I'm a huge Ciroc fan. It's my absolute favorite vodka. And I've had quite a few vodkas from the low, mid range, premium to ultra premiums. This is my top (EASILY). On top of that, this is my favorite flavor of Ciroc, which is crazy. So, that's wuz up. I'm probably gonna save this for a good party or something. We shall see =). 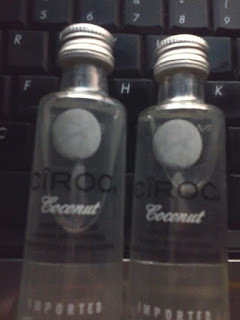 Speaking of Coconut Ciroc, have you tried the cocoloso yet? What's that might you ask? Well, it's simple 1 1/2 oz of Coconut Ciroc and like 2-3 ounces of Pineapple Juice. It's a very simple, but very good mix. GREAT FLAVOR, and it gets the job done for a party.